Freya - Animal Wonders Inc.
Freya was given to Animal Wonders after she was dropped off at a local pet store. The owner had become bored or overwhelmed with his collection of snakes, and Freya happened to be one of them. 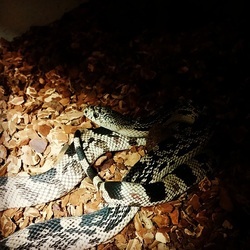 She has a typical personality for a pine snake, temperamental and puts on a big show of defense. Once she's held she calms down and explores.